A wide variety of fruit can be sown or planted now to fruit this autumn! My name is Nicky Kyle and I'm a Fruitaholic - I've finally admitted it! Caveat 1: Our distant ancestors didn't have juicers - so we were always meant to eat WHOLE fruits - not drink them as juices! Drinking pure fruit juices, or high sugar, tropical fruit juices and smoothies has a massive effect on raising our level of blood sugars very quickly - before our bodies have a chance to metabolise them properly. In addition to that - juicing wastes a huge amount of the healthy nutrients, especially the many, as yet still unknown, immune-boosting phytonutrients, which are contained within the pulp and fibre of the fruit. Some of which are not available from vegetables or any other food sources. Caveat 2: The fruits our early ancestors ate were also mainly in season - although some fruits would have dried naturally in the sun. There is also evidence that Middle Eastern and Oriental cultures actively dried fruits in the sun as early as 12,000 BC. If fruit wasn't healthy for humans we wouldn't have evolved to eat it! BUT - the fruit that they ate and the season in which they ate it was mostly varied - and they didn't have all fruits easily available all year round as we have nowadays. All recent studies confirm that eating a varied diet is the key to good health - not restricting whole classes of food which we actually evolved to eat. 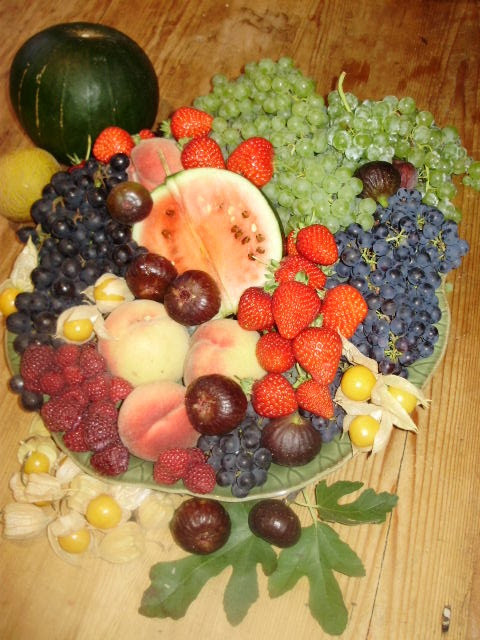 I believe that eating fruit is a vital healthy part of any well-varied, wholefood diet and that we only overload our body's capacity to metabolise fructose and other carbohydrates when we are also eating a lot of artificially-made fructose along with processed, highly-refined carbohydrates in other processed foods. If our ancestors didn't evolve to eat fruit as part of their wholefood diet - then we wouldn't have arrived in the 21st century! But many studies show that the population in general is not eating enough of the fibre which our gut bacteria would have evolved to metabolise, and from which they consequently produce many health-promoting metabolites. What is causing the epidemic of Type 2 Diabetes and associated health problems is not eating whole, naturally-grown, organic fruit - but all the other junk which we didn't evolve to eat - including artificial sweeteners which are actually toxic to our gut bacteria, that we have increasingly been eating in the last 50 years or so! Surely that is a 'no-brainer'? Exciting New Beginning to Another Fruit Growing Year! I'm always so excited when new fruit trees arrive - like a child at Christmas! I'm planting more trees into the new orchard again this year, to add to those initial plantings of 2 years ago. I decided to start planting a new orchard last year because the 35 year old orchard of 55 heritage varieties, which I planted just after we moved here, had almost completely stopped producing fruit because my neighbour ploughed up all the old pasture behind us and started growing grain crops every year. His spraying with hormone weedkillers in spring makes virtually all the flower buds drop off the apple and plum trees. Very little escapes depending on the timing of the spraying! So last year - fed up with no decent apples - I started planting a new orchard on the other side of the property, on the eastern side, as far away from danger as possible! The first dozen trees have established very well and I'm hoping that in time, with the shelter of the now tall garden trees, the strip of maturing woodland I planted 26 years ago and the house and outbuildings as well - that I may finally get enough fruit again. Sod's law though! The ground is saturated at the moment and far too wet to plant in without damaging it's structure permanently - so any new arrivals that are un-potted 'bare-root' trees are being 'heeled in' into tubs of old potting compost on arrival. Snug in the large tubs of recycled organic peat-free potting compost in the shed they're frost free - and will stay there to await drier weather - hopefully before they start shooting in March! If they look like starting into growth before the ground dries out enough - I shall pot them up in a soil/organic potting compost mix, dusting the roots with mycorrhizal fungi like RootGrow - so that they can start to establish a healthy new root system quickly. If moved after the tops have started into growth - they can get a setback. 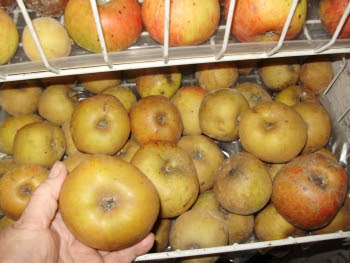 Apple d'Arcy SpiceWe've just finished the last of the wonderful crisp russet Ashmead's Kernal from my rather unconventional, re-purposed old freezer apple store. Every day from December to February every year I thank Dr. Ashmead - who bred this supreme, late-keeping eating apple in a village in Gloucestershire, way back in the 1700s. 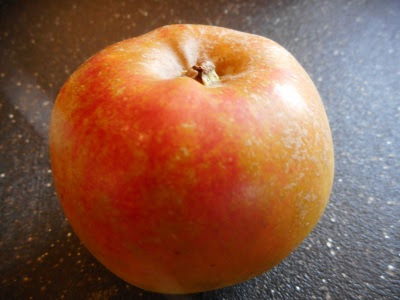 We've still got some of the even later-keeping apples, varieties like Kidd's Orange Red - an incredibly aromatic, almost pear-drop tasting, offspring of Cox's Orange Pippin - but happily much more healthy and disease resistant though, so has kept well. D'Arcy Spice is another delicious eating apple which is still crisp. We've also got plenty of the long-keeping cooking apple Bramley's Seedling stored too and also some Annie Elizabeth - a lovely tart cooking-apple that keeps well into April. This year I'm really looking forward to some new varieties, as last year I planted a few more heritage varieties which I haven't tasted before. That's a delicious treat to really look forward to! I find apples so addictive! In the home where I grew up, we had lovely old orchards and a large kitchen garden full of every kind of fruit - I really miss the huge variety we had. My father was a keen pomologist, and an expert on apples and pears in particular. As far as apples go in shops these days, most are grown for ease of harvesting and packing - not for flavour or seasonal variety! It's very difficult to get anything more than Gala (tasteless), Pink Lady (too sweet) or Braeburn (picked unripe) grown organically - either in shops or farmer's markets - and organically grown Bramley's are totally non-existent. I've never seen any on sale anywhere! All the new apple trees I buy from nurseries are on the root stocks M26 or MM106 which are the best ones for early fruiting in less than ideal conditions - like my very heavy clay soil. These grow to mostly about 15 ft/ 3 metres high and wide, they're productive and are fairly easily controlled by pruning. I'm planting some of the trees, along with other fruit bushes like Jostaberries and gooseberries, around the perimeter of the hen runs as the hens really appreciate shelter from the wind and a bit of shade in summer. Trees around their runs provide the ideal habitat for them - as hens are jungle fowl originally, love scratching about among leaf litter under trees and shrubs and don't like to be out in the open too much. In February I always put an old broken dustbin stuffed with straw upside down over the larger clumps of rhubarb to force them into growth a bit earlier. Not nearly as beautiful as those lovely terracotta rhubarb forcers - but actually I think they're more effective at attracting any late winter sun and warming up more. Baby 'Livingstone' - promisingly pink! 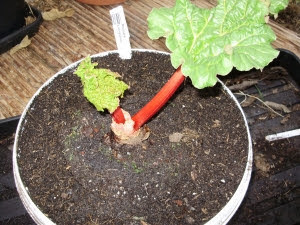 In autumn 2012 I bought a new variety of rhubarb - 'Livingstone' (new to me anyway but an old Victorian variety I believe) which produces lots of really red stalks in the autumn - unlike other varieties which are only producing green ones by then. It forces well in a large tub in the polytunnel and has a really good flavour. Traditionally in the old kitchen and cottage gardens, rhubarb was never pulled after English Derby day - which in the UK is in early June. This wasn't just because the plants needed a rest - but it was also because when the stalks are mostly green they are full of oxalic acid which is very bitter and could give you kidneys stones if you are susceptible! You should never eat green rhubarb for this reason. I'm amazed that shops still sell it in summer and autumn - even when it's bright green - and unsuspecting people buy it! It probably needs about half a ton of sugar to make it at all palatable! But then - thinking about it - since when did shops ever worry about people's health?! The health of their balance sheets is all that really concerns them! Oxalic acid from rhubarb's green stalks and leaves can actually be made into a very effective pesticide - so that should surely tell us something? (although don't tell the EU - because it's actually illegal to make your own)! Odd that isn't it - when shops can actually sell it to us as a food?! Mind you - they also sell us food laced with other legal pesticides, many of which are so old that they've never even been properly tested for safety! Anyway, as the ground was already far too wet to plant my new rhubarb - I planted it into one of those 10lt. recycled buckets I've used for growing tomatoes in for the last couple of years and put it in the tunnel. Pictured here last Feb it's looking quite perky and already has about 6in/10cm of juicy looking red stalks on it - but I resisted temptation and kept my hands off it - putting it outside for the rest of the year - to give it a chance to build up a nice crown. I brought it into the tunnel 2 weeks ago and put a large pot over the crown to encourage it. It's already making some small, mouth-wateringly deep pink shoots which I shall allow myself to sample this year. Not too many, as I shall pot it on soon into a larger tub to give it more root room, and feed it well - then it may crop well in the autumn, after a summer holiday. I'm not sure how long it will be happy in a tub - but it should be fine in a large tub in shady corner if kept well watered. Anything that makes use of difficult corners in a tunnel is very valuable - and it will hopefully stretch the fruit season at either end just that little bit further. If you're just starting off a new fruit garden - there's still just time to plant bare root fruit trees and bushes into the ground, if soil conditions aren't too wet. Or heel them into pots as I mention in my apple piece above. Never attempt to plant anything - particularly fruit trees - into a wet sticky soil! Instead you could pot them up for now in a soil/compost mix. Make sure the pot is a lot larger than the roots to give them room to spread out instead of winding round. If you've read my blog before you'll know that I use large plastic carrier or bin bags for this - making drainage holes in the bottom. Don't use a pure peat compost - apart from destroying bogs by using peat (and you know my opinion on that!) the roots of large trees often never move out into the surrounding soil properly if they've been potted into peat composts - something you may not discover for a few years until they're carrying a heavy crop and the wind blows so hard it causes them to keel over! What are the Best 'Autumn-Fruiting' Raspberry Varieties? The newer 'primocane' varieties like 'Joan J' seem to concentrate their energies a bit more into the fruit - unlike two of the older type of autumn varieties which I planted years ago - 'Heritage' and 'Autumn Bliss'. Those two have much smaller fruit which doesn't have nearly such a good flavour. They also have serious territorial ambitions and seem to enjoy trying to run all over the garden, popping up in all sorts of unexpected places and becoming an absolute nuisance. I wouldn't dream of giving them away to friends though - knowing how much of a pest they can become! As I hate wasting anything I dig them up and plant them down in my small patch of woodland for the wildlife. There they can go back to their original woodland roots - running around and doing exactly what they really like - and while doing it they provide natural cover and food for the birds - who really enjoy them! Sadly though - it was a vain hope that if the birds have their very own fruit patch they'd leave mine alone! Dream on - instead they just bring all their friends along to the party as well!! Woodland Gardening - or Just Feeding wildlife? For many years now I've been planting all sorts of stray seedlings of fruit bushes and trees in my little patch of woodland here. I'm always finding blackcurrant or other seedlings when I'm weeding - particularly where the birds have been sitting on branches and digesting their breakfast! I hate wasting them! Perhaps one day I may even be rewarded by finding a new hybrid variety - that's if I ever get to see any of the fruit before the birds eat it all. "Forest Gardening" is a new term for this habit of mine which has been coined by a man who recently claimed to have invented it - well he invented the name - but not the practice. But apparently it's the very latest fashion! Anyone into wildlife gardening or permaculture like me has been doing it for years - but we just didn't call it a fancy name! Anyway - I actually plant them for the birds - in the vain hope that they'll leave mine alone! It's always amusing how very different many of these romantic-sounding ideas are in practice! I have to say I often wonder if those who invented the term have ever actually even done it? Unless fruit is covered with netting, the birds eat it all! Well - they do here - because I have so many - instead of leaving my fruit alone they just invite their pals to dinner as well! Once again - it's an extremely attractive sounding idea that doesn't really work in practice - not if you actually want a crop! It's a sort of 'fuzzy and warm' idea in a very 'Country Living- ish' kind of way! It's hard enough to keep the birds off the fruit in the garden - apple trees are far too big to net and my blackbirds go for them the second they can see a bit of colour! The little dears! Nature, by the way, has been doing it for millennia - the birds drop all sorts of interesting varieties of berrying shrubs in the garden when they're having an after dinner snooze on any handy branch. A few years ago I found a very pretty scented berberis with edible berries later - which I'd never planted! The nearest bush that could possibly have come from was at least a mile away!! And a few years ago, I discovered a new blackberry/bramble hybrid growing in the field here which every one was sampling eagerly and asking for cuttings of. Obviously it is a wild bramble/Himalayan Giant cross from the flavour, the obvious similarities and very vigorous habit. It's been given away to several grateful gardeners (including my 'Tunnel to Table' co-presenter Gerry Kelly) with a severe health warning! Ever Thought of Growing a Grapevine? Grape 'Perlette' - (a seedless variety)All fruit is expensive these days - particularly if organically grown. A bunch of grapes can cost at least 2 or 3 euros - whether organic or not - and they're very easy to grow considering they're such a luxury! In just it's second year after planting a vine should actually pay for itself in fruit. You don't necessarily need a greenhouse or tunnel, or even have to grow them in the ground either. You can grow them quite easily in a good well drained, soil based compost in tubs or pots as standards. A standard grapevine is like a small tree, on a single stem, with branches arranged a bit like the spokes of an umbrella) - that way they take up very little space and it means you can bring them into a glass porch, a sunny window or a conservatory - for a bit of TLC when they're flowering - and again later when they're ripening their fruit. Dry weather is important at flowering time for grape pollination - and also when they're fruiting - the later varieties also really appreciate the extra warmth to ripen their fruits. Being able to bring them inside when they're fruiting also means more protection from pests. Growing vines in pots also means that you can grow a lot more varieties too. You don't always want 200 bunches of grapes ready at the same time - and the family tend to go on strike when faced with juicing them! Juicing is something I don't do any more anyway - because juice is pretty much pure sugar and you only get all the nutrients in grapes, including the valuable heart-healthy Resveratrol, if you eat the whole grape including the skins and pips. Blending them in a Nutri-bullet blender is far better for you. Don't Prune Indoor Grapevines Now! If you already have a grapevine and didn't get round to pruning it - for heaven's sake don't panic and prune it now - it's too late. It's been so mild in the last couple of weeks that buds on many fruit trees are already moving about 2 weeks earlier than usual. In milder areas or in warmer greenhouses and tunnels - vines are already beginning to wake up and the sap's rising. If you prune them now after the sap starts to rise you could severely weaken or even kill them! They can quite literally bleed to death if the sap is rising fast, particularly indoors in pots where they start into growth a bit earlier. I once pruned a vine too late many years ago and it's very scary believe me - it's just like turning on a tap! It's something you never, ever, make the mistake of doing again!! Wait until the shoots start to grow later on, and 'rub out' or 'pinch out' those you don't want to grow. They may not look as organised and tidy if you do that - but they won't bleed. The buds on my earliest varieties of grapes in the tunnel are already fattening and beginning to swell. The other thing that needs to be done now - if you haven't already - is that the main stem or rod of grapevines needs to be lowered by untying it from its support and laying down as horizontally as possible so that the sap is distributed evenly along it's length. Otherwise the sap will just shoot straight up to the tip - if you leave it upright. Vines in tubs can be laid on their side if being trained as a single stem or in a spiral as I do with some - or you can leave them upright if they're grown as standards with several buds all breaking from the same level. If you don't do this - when the vine starts to grow it will send all it's energy into the buds at the very tip - leading to uneven growth along the stem with some fruiting spurs not developing as well as others, or possibly not even growing at all. The main pests I find a nuisance are wasps, birds and mice when the fruit is ripening - but otherwise I find grapes have very few problems. Protecting the fruit with netting or using traps is the only way to deal with those. Pests you may occasionally see are either scale insect or woolly aphids - these often come in on new plants bought from garden centres. These are easily dealt with by using an organic fatty acid spray once or twice or by painting them with melted coconut oil. This coats the insect's skin and stops it breathing. These methods are very effective - so there's no need to use the highly toxic sprays usually advised in many books or articles on grape growing. Contrary to what many people think, they're actually very hardy when growing in pots. Even in the very low temperatures of 2010/2011 winter - mine all stood outside with the pots protected so that they didn't get frozen solid. Growing in pots also means you can grow several different varieties, to give you a longer season of fruit. If you have a south facing wall many varieties will grow well there. The wall acts as a kind of storage heater - keeping the frost off in early spring and then helping to ripen the fruit in the autumn. They make a very attractive ornamental feature on a patio too - bringing a real touch of the Mediterranean into the garden, particularly when they're fruiting. A few scarlet geraniums in terracotta pots, a bit of sunshine and you'll almost think you're there!! All you need then is the deckchairs and a bottle of wine - which you might even make from your own grapes if you have enough!! Even bare root vines can be planted in the next week or so - and potted vines can naturally be planted anytime. I actually prefer to plant mine inside the tunnel if I'm growing them in the ground - because that way I'm much more in control of the watering. When the fruit has 'set' it's skin and is ripening - there is nothing more heartbreaking than to have a sudden deluge of rain - which can cause the fruit to split and to start going bad. That's far less likely to happen if they're planted inside and kept evenly moist. Many garden centres and shops seem to have potted grapevines this year - but make sure they are strong plants with a decent firm root system - not a wobbly, weak root system which may either indicate vine weevil infestation, or that the plant may have been sitting in water all winter and be half rotten - like some I've seen for sale! Vines never recover from this treatment as they're very fussy about good drainage at their roots. As I've said before - given the right conditions and pruned properly they can be extremely productive - and well worth growing - particularly in a greenhouse or tunnel. If you don't have a tunnel and you're going to try growing them outside in this part of the world - you really need to choose the earliest varieties or they won't have time to ripen - particularly here in Ireland with our often damper autumns. With climate change our weather is becoming less predictable too - so I think giving them a prime spot on a south facing wall is well worth it. In the south of England though where there's a slightly drier climate - there are many vineyards now on the more free-draining chalky soils. There are many award winning wines grown there. In London too - with it's even warmer micro climate - a lot of people now grow vines as a very productive ornamental feature on pergolas - but they don't tend to do very well here grown like that - the leaves look lovely - but they never produce much worthwhile fruit! Sadly it's just not warm enough most years. Which Varieties are Best - Seedless or Seeded? It depends what you like best - although there is some evidence that black grapes contain more healthy nutrients. I have a lot of different varieties here - over 20 I think (I've stopped counting now!) They're one of my favourite fruits - but I'm mostly planting new seedless varieties these days. I think if you're eating them fresh as dessert grapes, or dehydrating them for sultanas - it's much nicer not to have seeds in them. Unless you have endless time to thin grapes (life is definitely too short!) or have a full time gardener (I wish!) 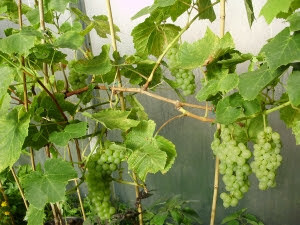 then seeded grapes can be very small, 'pippy' and fiddly if not thinned, although they're fine for smoothies etc. An exception to this is the wonderful seeded variety 'Muscat Bleu' - which I think is the absolute 'caviar' of grapes - with it's rich, deep, muscat flavour - just like the very best muscatel raisins. It's actually self-thinning in a very convenient way - producing long, well-spaced bunches of huge blue-black grapes with the most heavenly muscat flavour! Like all black grapes - it's also very high in phytochemicals like resveratrol - which are beneficial for our cardiovascular health in particular. Good white seedless varieties - 'Lakemont Seedless' - early, very disease-resistant and the best for making sultanas by dehydrating (unbelievably scrumptious and irresistible, 'Perlette', 'White Dream' and 'Himrod'. Good reds or black seedless are 'Flame', 'Vanessa', 'Blue Dream' and 'Rose Dream'. I grow all three of these - 'Rose Dream' is the earliest and produces the best crops in a bad summer. It's very sweet but doesn't have quite as good a flavour as 'Flame' which is much later but has large, delicious berries with a bit more acid to balance the sweetness. You often see 'Flame' in supermarkets - but you'll never see chemical-free organic ones on sale anywhere here. Vine leaves are useful too and also high in nutrients. You can blanch and freeze them for cooking 'stuffed vine leaves '. Vine leaves are the only thing I ever blanch as this makes them pliable so that they don't shatter when frozen. There are many varieties of seeded grapes available - 'Boskoop Glory' is a good disease resistant, very productive and reliable black, so is 'Black Hamburgh' but a bit later. 'Bianca' an early, very sweet pale green/yellow and 'Chasselas Dore de Fontainebleau' is a hugely productive, very sweet golden grape that ripens in early September. My son has never forgotten the time he had to juice well over 200 bunches of that variety years ago - when I was away - bless him. I think he's only just forgiven me!! 'Muscat of Alexandria' I've seen being sold everywhere with a label that says it will grow outside - it it will grow - but only leaves! It's so late fruiting that it only reliably produces ripe fruit in a tunnel or greenhouse unless you live near the Mediterranean - where I think a lot of the potted nursery stock is actually grown these days! I've done a 'trawl' on the web - and only Ken Muir in the UK have 'Muscat Hamburgh' which I think is the best-tasting black. It's also the main one that those gorgeous Muscatel raisins are made from. They also have another very good black called 'Regent' - my 5 year old vine had a fantastic crop on here last year - it was literally dripping with grapes! It's a seeded variety which also tastes very sweet and 'raisiney'. The dark brown-fruited 'Brandt' is another good-flavoured variety that will grow well outside and also has beautiful autumn colour. If you want to buy mail order grapes - it's advisable to get them as soon as possible as the young shoots can easily get knocked off in the post if they're delayed for any reason and start to grow. Ken Muir's Nursery in UK have a great selection of figs and grapes. I like to visit garden centres to compare value - (strictly in the interests of research you understand - although I have been known to purchase the odd little thing occasionally!!) It's amazing how much prices can differ for exactly the same plants - and the quality too. These days value for money is all important - and one of the things I have always tried to do here is to let you know about anything I think is good value! It's surprising the amount of savings you can make if you shop around.......The discount supermarkets Aldi and Lidl often have great value on fruit trees and bushes at this time of year - so cheap you really could plant them just for the birds if you were feeling generous! They're all good, reliable varieties well worth planting in your fruit garden - and a fraction of the price you will find them elsewhere! So keep your eyes open in the next couple of weeks! As I've said before - their peach trees are exceptionally good value and I had a huge crop on the 8 year old trees last summer in the tunnel (well over 200 fruits on both trees!!) That's why I invested in my dehydrator - I adore dried peaches and there are only so many you can eat fresh - even though they do ripen over a couple of weeks! In the summer, time is always at a premium, bottling takes ages of 'faffing around' when you have least time - and freezer space is never plentiful enough here! The peach Aldi had last year - was 'Red Haven' - which is hardy, disease resistant variety and very productive. If you don't have tunnel you can grow them as a fan against a south or west-facing wall and cover with a polythene frame in late winter/early spring to keep away peach leaf curl, and they will produce loads of fruit! The ALDI price last year (bare root so you have to pot up or plant) - was just €4.99. For comparison - in Homebase for exactly the same variety - a similar sized but potted tree - the price was €11.98, and in a well known garden centre - same again - €55!! They'll probably be even more this year as everything seems to have gone up in price! - Funny how things never seem to go the other way isn't it?? Anyway - If you see them in Aldi or Lidl - do buy them as soon as possible or they'll start to shoot in the warm shops - unpack them as soon as you get them home and pot up or plant immediately as they start into growth early - mine are already swelling their buds now. This is a fruit that must be sown now in a warm propagator if they're to fruit early enough to give a decent crop this autumn. I grow some from seed every year. They're dead easy and grow like weeds from seed. Someone said recently that they're difficult to germinate - they're not - just slow! They take about 3 weeks to come up and then do it all at once! I was also reading somewhere recently that apparently they are the very latest Peruvian so-called 'super fruit'! I've been growing them for at least 30 years! You're not going to believe this - but we're still eating those I picked last November - stored in the fridge! They're being strictly rationed now though! They're a waste of time outside as they won't fruit early enough to bother with. I grow them in tubs in the tunnel, as this restricts root growth a bit which makes them fruit even earlier. Each year I overwinter some of the previous year's plants in the tunnel under fleece as they're actually half-hardy perennials. They fruit much earlier than those sown in February, and in that way I get a longer crop of these delicious, 'sherbetty'/'pineappley' tasting fruits. They're very high in Vitamin C and the phytochemical lutein (good for eyesight & which we can only obtain from plants) among many other good things - they grow like weeds, are really delicious and fruit generously for months. Although they're quite soft and sappy they are hardier than their tomato cousins and each year I leave a few in their tubs, overwintering them in the dry in a tunnel so that they fruit earlier the following year. They start to produce new shoots from the base around now, so I cut back the protecting, now defunct, older shoots and they'll start to fruit in July, instead of September, when the ones sown this year do. A good tomato feed like Osmo* when they show signs of growth and away they go - but after their second autumn I compost the two year old plants, as they tend to go downhill with age! 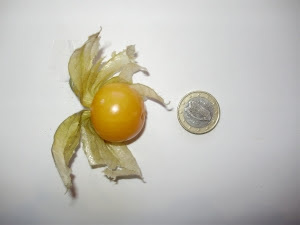 Although the leaves are reputed to be a folk remedy for diabetes in Africa - like other members of the Solanaceae (tomato) family - all parts of the plant, apart from the fruits, are highly toxic and dangerous if consumed! I read a very amusing article a few years ago by the food writer Susan Jane White - who likened the fruits to Victoria Beckham: "bright orange and deluded" (her words!). She may just possibly have been confusing their looks with the ornamental (inedible) type, as these are shown when you 'Google' them. At the same time, if you don't grow them yourself - they are very definitely extremely expensive and highly fashionable! The similarity ends there however, as they're really easy, good-natured, generous and not the least bit sulky, difficult or 'Prima Donna-ish'! They are one of the most productive annual fruits you can grow, and when you grow them yourself, not only are the fruits chemical free - but are usually larger than those you'll find as a garnish on your plate in fancy restaurants, as you can see from the picture here. NOTE - DO NOT CONFUSE THESE WITH THE ORNAMENTAL CHINESE LANTERNS WHICH ARE A VERY PRETTY DEEP ORANGE, and fruit in the autumn - harvest festival flower arrangements are all these are good for! If you grow them yourself from seed, rather than buying them in a garden centre where the assistants sometimes don't know one plant from another, you will be sure that you're getting the edible one! The leaves are very similar - bu when the edible ones are ripe - the outer husk is a pale straw colour and the fruit inside is the ONLY thing that's bright orange. The sap is starting to rise, and although things like apple trees don't bleed like grapes - you don't want to waste the plant's energy by letting it make shoots you will cut off later - concentrate it into the ones you want to grow. Don't prune any stone fruits like plums and damsons now - wait until late spring to do this - before then they are very susceptible to silver leaf infection. Keep any twiggy prunings somewhere dry until you can burn them later in the year - they are rich in valuable, very highly-soluble potash and can be used for feeding all fruit and veg. The same goes for the ash from wood burning stoves, although ash from bigger logs is not as high in potash as twiggy prunings but it's still valuable. Bear in mind that all wood ash will raise the soil 'pH' slightly, so acid lovers won't like too much - use seaweed meal for them. The best way to use it is to mix it through the material you are putting onto the compost heap - I keep the ash from my stove in a bin to keep it dry and then sprinkle it one as I'm adding stuff to the heap. I get my properly seasoned 2 yr.old ash logs - cut to whatever size I specify - delivered in handy reusable skip bags from Peter Barry at www.logonfirewood.ie - much easier than having them dumped and having to stack them - saves a lot of time and backache! It also means they arrive totally dry and ready to go - and they don't mess up your stove or chimney. Buying them in bulk means they're a lot cheaper than in small bags bought a few at a time - which are usually not dry, are unsuitable wood and not properly seasoned either - messing up your stove. The skip bags are then great for re-using to make leaf mould, compost, or even better as extra large grow bags/raised beds. Black sooty mould is a good sign that there may well be some. If you do find any - spraying them with an organic insecticidal soap or again painting them with coconut oil works like a treat. These are approved organic remedies which are perfectly safe for any food plants. They work by covering the insect's pores with fatty acids so that they suffocate. Do it now. Don't spray it on lemons or other citrus when they're making the very tender little new pink shoots in a few weeks time - doing that can burn them - particularly in strong sunshine. If you don't do it now - then wait until the new shoots firm up a bit - although by then you may have a real infestation which may have weakened the plant! It's much better done now. Don't ask advice at your local garden centre - in my experience they know nothing about citrus trees and also they'll just recommend some very nasty organo-phosphorus insecticide for use on house plants which will actually make your lemons poisonous. I think that anyone selling pesticides to people should first have to pass an exam to prove they actually know something about what they're selling, other than just from the instructions on the back of the bottle! I simply could not believe my ears last year to hear someone who was supposed to be a gardening 'expert' (here I go again - but really!!) on the radio. He recommended that for scale insect on bay trees people should either use a systemic insecticide (scream!) - or that if they 'were organic' (weird in so many words) then they could use methylated spirits! OMG!! Not only is that not remotely organic - but does he not know that people actually eat bay leaves?? I wouldn't fancy meths. in my stew thank you! So called 'experts' who don't know anything about organic growing shouldn't pretend to - someone could be made seriously ill! They should be honest and admit that they don't actually know if that's the case! But so few of these 'experts' do. There's an old saying isn't there........?...... "It's a wise man who knows what he doesn't know"! Don't feed citrus trees yet - unless they're in a heated conservatory in which case they may be making new growth. I like to use a good high nitrogen fertiliser for citrus which also very slightly lowers the pH - just what they like. A couple of years ago I discovered the Osmo range of certified organic fertilisers*, I use them all the time for my citrus trees now, they are really good, and I use rain water (no shortage of that!) to make them up. Citrus plants are actually acid loving plants like rhododendrons - so never water them with tap water either. Always use rainwater. If they're looking sickly and yellow - it's something called 'chlorosis' - which they get if given tap water. If that's a problem - wait until they're starting to grow again and give them a dose of sequestered iron, mixed into rain water. That fixes the problem miraculously - greening them up again in no time. You'll find a product called 'Sequestrene' being sold in sachets in good garden centres. I'll be giving my lemons in the tunnel a very light watering of rainwater this week - not saturating them - as just like grapes they really hate sitting in wet soil. In another month or so they'll really start to growth - then I'll start to feed and water them a bit more. They won't go outside until at least the end of May though - the young shoots and flowers are vulnerable to frosts. Give fig trees in pots an early spring feed now - they'll be starting into growth soon too. The top buds on mine are already showing signs of moving. Scratch off a bit of the top soil in the pot - feed them with a balanced organic feed or seaweed meal, top up again with a little good compost, and water it in. Wait until next month to feed those outside as they'll start growing later and the food will just wash away, be wasted and pollute groundwater. Take off any overwintered fruitlets that are larger than pea size if you haven't already done so, these won't develop and will either drop off or rot on the stem - possibly causing disease. Clean up established strawberry beds, cutting off all the old leaves carefully without damaging the crowns. Feed them with seaweed meal which supplies slow release potash for good fruit development. 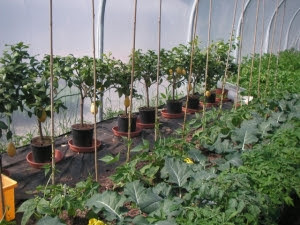 Pot up some of last year's runners and bring them inside for an early crop. 'Christine' is the earliest variety for doing this - I always have strawberries in mid May. Sow some alpine strawberries now, and they will fruit all summer long until the first frosts. I grow the delicious and aromatic 'Reugen' (Chiltern seeds) which is a very good variety - huge fruit for an alpine, or 'Baron Solemacher' the next best. There's a white fruited variety you can grow from seed which totally fools the birds and looks attractive in a fruit bowl. There's even a very pretty golden leaved one too - Golden Alexandria (Suttons Seeds I think) - lovely for an edging in an ornamental potager. This year I'm going to try to spread the season of the unkown old white strawberry (poss Chiloensis) I have by growing some in pots in the tunnel again and then some outside as well. It's the only summer-fruiting type I grow now as I find the 'Albion' perpetual fruiting one produces so well from May to November that the others an unnecessary use of space that can be better used by other fruits. When it dries up enough to walk on the ground without sinking in at all - feed and mulch all established fruit trees and bushes with a light dressing of very well rotted manure or home made compost, a proprietary compound organic fertiliser, or seaweed meal plus a good mulch. 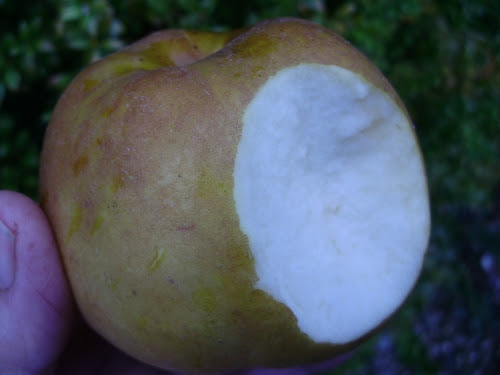 If you had problems with 'bitter pit' in apples (small round black spots on fruits - caused by poor calcium uptake in wet soils) top dress the soil around them with calcified seaweed - which provides lime, trace minerals and encourages biological activity in the soil. Prune older shoots out of blackcurrants. Blackcurrants really appreciate nitrogen, as they fruit mostly on young wood made the previous year, so you want to encourage plenty of new growth each year. I often put my chickens in the fruit cage in winter, they supply nitrogen and pick up pests at the same time! *Osmo certified organic fertilisers and liquid feeds are available in many garden centres now. They are also available in Whites Agri at Ballough, Lusk, Co. Dublin. Whites are the Irish importers for Osmo and have a good range of really reliable products that work well. Whites also now stock the Klasmann peat-free seed compost and potting compost which I recommend. You don't have to buy in agricultural amounts - they are more than happy to just sell you a bag. They are brilliant composts, the best I've ever used, and worth every single cent. Once you've tried them you'll never go back to using habitat/biodiversity destroying and disease-encouraging peat composts I promise you!